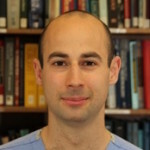 As a senior neurosurgical resident at Dalhousie University (Halifax, NS), Dr. Brandman has taken time away from clinical training to complete a PhD in neuroscience at Brown University and stay on as a postdoctoral fellow. Under the supervision of Drs. Leigh Hochberg and John Donoghue, Dr. Brandman’s research focuses on the development of new methods to decode neural signals for use in brain computer interface technology, by incorporating state-of-the-art methods in artificial intelligence. His other research interests include understanding the neural correlates of reaching and grasping in motor cortex, and in developing algorithms designed to allow neuroscientists to intuitively visualize complex neural signals. Dr. Brandman is fortunate to be the recipient of a Canadian Institute of Health Research foreign doctoral fellowship, a Killam Trust Foundation Award and to be a member of the Canadian clinical investigator program. After completing his postdoctoral and neurosurgical training, he intends to pursue a fellowship in functional and stereotactic neurosurgery. He hopes to become a surgeon scientist, with the goal of developing robust restorative neurotechnologies for individuals with motor impairments.